Looking for a beach front home in Dana Point? Being right on the Pacific Ocean, south of Laguna Beach, makes Dana P oint a unique destination for those who want to buy a home right on the beach. Dana Point offers distinct neighborhoods that will have homes sitting right on the sand, like the Beach Road, in Capistrano Beach, some Monarch Beach homes and some Lantern Village area homes. Below you'll find all the available beach front homes for sale in Dana Point, including the beach front homes in Capistrano Beach. Follow the link for other beach front homes in Orange County that are available for sale in other beach cities or read more about the communities offering beach front real estate in Dana Point. With several options for the ones looking for beach front real estate in Dana Point, it will depend on how secluded or surrounded by amenities you would like to be. The famous Beach Road Homes Community, is a guard gated community, with all types of custom homes in Capistrano Beach of Dana Point.This area is more secluded than others as the neighborhood is about the only development on the sand in this area. Niguel Shores, another guard gated neighborhood sitting right next to the Ritz Carlton, will feature some homes that will be beach front too, with access to the Dana Strands Beach, and these homes will have another private gate within the gated community. There's also some custom homes located along the coast, part of the Lantern Village, that will sit atop the Dana Point Headlands Bluff and will have breathtaking panoramic views of the Pacific Ocean, Dana Point Harbor and the Southern California Coastline. The new gated community 'The Strand at Headlands', features some luxury beach front real estate as well. The Strand Homes that are beach front, overlook the Dana Strands Beach, are the newest beach front development and had a lot of controversy before being built, as it is sitting in prime real estate land. Lastly, the gated Ritz Cove neighborhood, part of the Monarch Beach area, has several estates that have private gates directly on to the trail that sits atop Salt Creek Beach. Ritz Cove Homes also enjoy the Monarch Bay Club amenities and a vip treatment, as being next door neighbors to the Ritz Carlton Laguna Niguel Resort. If you would like further information or assistance regarding Dana Point Beachfront Real Estate and available Dana Point and Capistrano Beach beachfront homes for sale, please contact us, or visit our main page at Dana Point Real Estate. 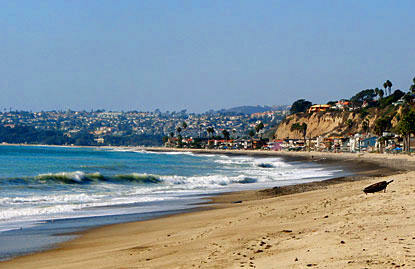 OCExecutives specializes in real estate transactions of Beach Front Homes in Dana Point, California. Contact us today to sell real estate or buy real estate in the beach front communities of Dana Point or for more information about any of these Beach Front homes. If you would like to see a list of homes in other communities in Dana Point, follow the links above, or click here for other Dana Point Real Estate.